After almost a month of flying outside the US, today’s (July 12) flight allows us to return to more familiar domestic flying. While the plane does not care what country it is flying in, for the pilots it is nice to be back to familiar procedures and easy to understand air traffic controllers. 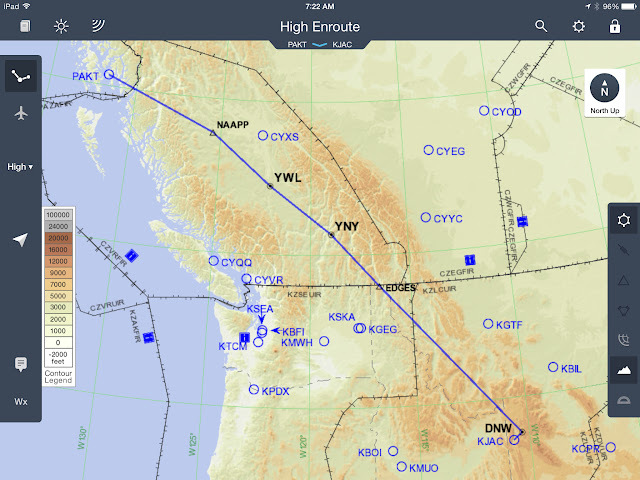 The flight for the day was from Unalaska, Alaska to Jackson Hole, Wyoming with a fuel stop in Ketchikan, Alaska. It was nice to not have any customs or immigration worries for a change. It is the first flight in nearly a month that we did not have the assistance of "handlers” at either the departure or arrival airports. Winds were calm when we departed Dutch Harbor and the visibility and ceiling were well above the minimums. We departed runway 31 (heading northeast) and were climbing-out on course within just a couple of minutes. The cruise portion of the flight to Ketchikan was smooth and in clear skies. 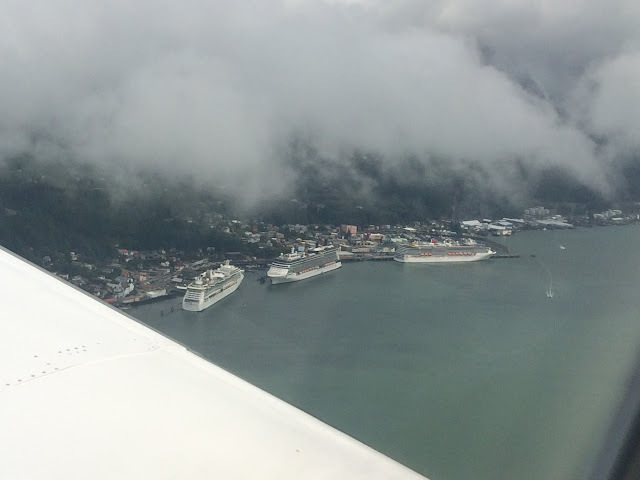 Like Dutch Harbor, the weather in Ketchikan was cloudy, but well above the minimums we needed to land. The air traffic control folks at Ketchikan had a well-established flow pattern for the floatplanes to separate them from the traffic arriving and departing from the runway. We never felt uncomfortably close to the other traffic despite the density. The parking ramp at Ketchikan is unusual in that it is about 50 feet lower than the runway. Thus, the taxiways have considerable slope. We used lots of braking taxiing in from the runway and a fair amount of power to taxi “up” to the runway for departure. After a quick and efficient refueling and quick break, we blasted-off for Jackson Hole. It was an uneventful flight with smooth air and clear skies after the climb-out from Ketchikan. I was a little sad because I knew this was, for practical purposes, the last leg of this big adventure. It was clear skies and smooth air in cruise all the way to Jackson Hole. After crossing a bit of Canadian airspace, we crossed into US airspace. The weather for our arrival into Jackson Hole was forecast to almost perfect. We were cleared for a visual approach about 30 miles out which allowed us to maneuver for a gentle approach with great views for the "first class" seats on the right side of the airplane. While I kid a lot about my spouse, none of this trip would have happened without her constant support. There are times in a relationship when you really know how deep the love extends...this trip was one of them. This is the end of the trip for most of the crew, but Josh and I will continue on to Austin tomorrow (July 13) to officially complete the 360 degree circle.